For those of you who are not familiar with the concept, here is a little guide to help understand what is going on. It’s a general knowledge quiz held in a pub, bar or café. The attendees form teams and one person (the Quizmaster) asks the questions split into rounds. At the end of each round the questions are marked and a score is given to each team. After all the questions have been asked the team with the most points wins. In the case of a draw a tiebreaker question is used. The winning team usually wins alcohol. What sort of questions are there? General Knowledge can cover everything from history to music to geography to sport to everything in between. They are designed to be not too difficult, but hard enough to generate debate! You can see the questions from previous Cigale Pub Quizzes here. Not really, the idea is to have fun. The only cardinal rule – and this applies to all pub quizzes everywhere – is that no googling (or use of any other internet search engine) is allowed! Teams of up to 6 people are allowed and it’s a good idea not to shout the answer out too loud if you know it – you don’t want to help out the opposition! 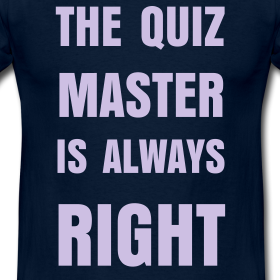 In a dispute, the Quizmaster’s decision is final! When is the next quiz? The date of the next quiz will be posted on this site and on our Facebook page as soon as it is confirmed. At the moment it is always on a Monday evening in La Cigale – normally the second Monday of the month, but if the second Monday falls on a feriado (Argentine holiday) the quiz usually moves to the third Monday. You can also use the latest tag to see the next date. I’m organising my own Pub Quiz – can you help? Of course – you can use the questions posted on this site for your own quiz – they are freely available. If you need anything else, drop me a line.